Yeah, go ahead and tend the flag for me, will ya? Ego and insecurity can be terrible, debilitating handicaps in the game of golf. Just two days and four holes into 2017, I received my first embarrassing dose of involuntary humility. A welcomed weather anomaly resulted in above average temperatures, allowing Bryan and I the thrill of playing golf in Central Kentucky on January 2nd. 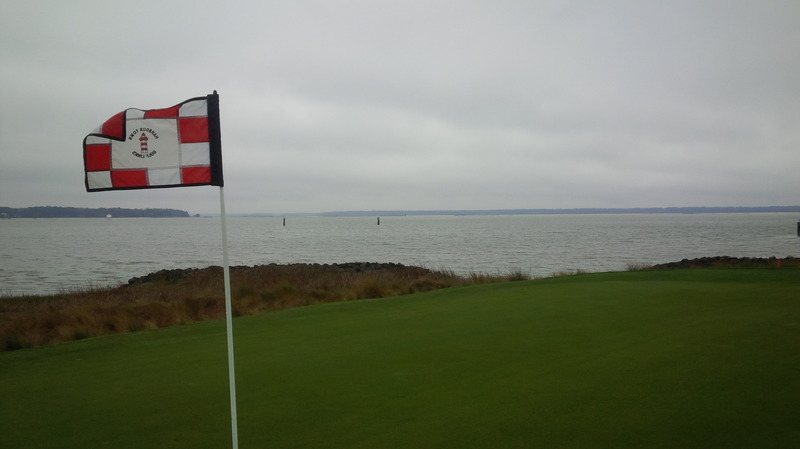 The weather around Christmas had been bitterly cold and wet, which meant that The Thoroughbred Club’s greens hadn’t been mowed in at least a week, but that couldn’t have mattered any less; we were just happy to be on a golf course. This isn’t the hole in question, but the distance and elevation change are dead ringers for that I encountered at the Thoroughbred Club to start my golf year. We were the first pair of golfers out on the course in a dense fog following a rainy evening, meaning we were literally the dew sweepers, though the combination of surface moisture, soggy turf, and long blades of grass made us feel more like trench diggers on a warm, gray day. After a couple of months away from the game, I waited until the short, par 5 fourth hole to pull-hook a drive. So, by the time I left my birdie pitch on the very front edge of the green, some 40 to 50 feet short of the hole located on the top tier at the back of the green probably a couple of feet below the hole, I thought I’d finally got a handle on the slow green speeds. My partner was much closer to the hole, as his 2nd chip came to rest just 10 or 12 feet from the cup on the proper tier of the green. Thus, the honor was mine. I walked all the way up to the hole to get a good look at the terrain, trying to figure how much, if at all, my putt might break given the quarter-acre of Velcro between my ball and the hole. Without thinking, concentrating much more on engaging my new pre-shot routine for putting, I confidently replied with my stock answer, “No. Thank you.” It’s my standard reaction, my first instinct, to decline having someone tend the flag for me. The origin of this machismo gone rogue is probably three-fold: 1) the “I don’t need your help” attitude that clings to my mind, 2) the desire not to inconvenience my playing partner, and 3) the fear that if I do have someone tend the flag, and I still miss the putt badly, I will look even more incompetent on the golf course than I already do being so far away from the hole that I might not be able to see it. The flag is your friend. Never be afraid to use it. Pride and fear are just killers on the golf course, and what happened next is a perfect example of why that is true. Bryan removed the flag and returned to his ball while I finished a couple of practice strokes . I gave the hole one last brief look before addressing the ball and mustering all my strength to hit this mammoth uphill putt. Except that when I gave that cursory look…I didn’t look at the hole. Did you know that at a shallow angle from 40 or 50 yards away, a small, wet, decaying oak leaf looks just like a hole on a green at the same distance and angle? I didn’t until a few seconds after I hit the putt. 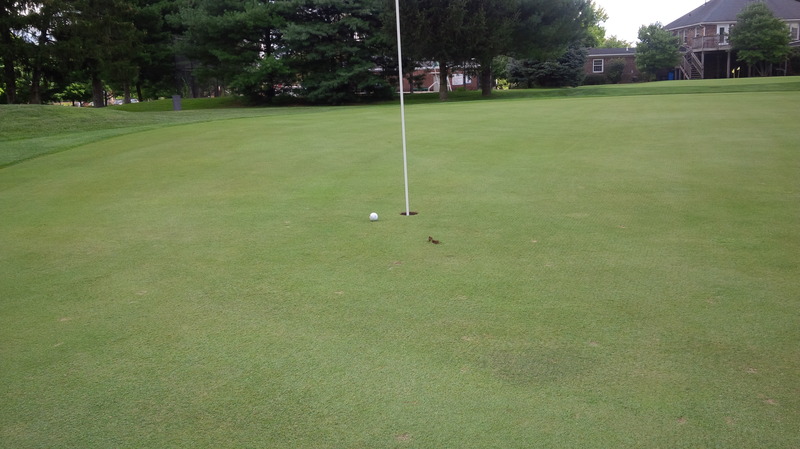 I had lined up to and putted my ball at a leaf laying on the green about 7 or 8 feet to the right of the hole. But that’s not the worst part. The most embarrassing part of the whole affair is that I’d read and played the break to the actual hole, not to the leaf, so I ended up missing the leaf by two feet to the right, which, as it happened, was not on the hole-side of the leaf. 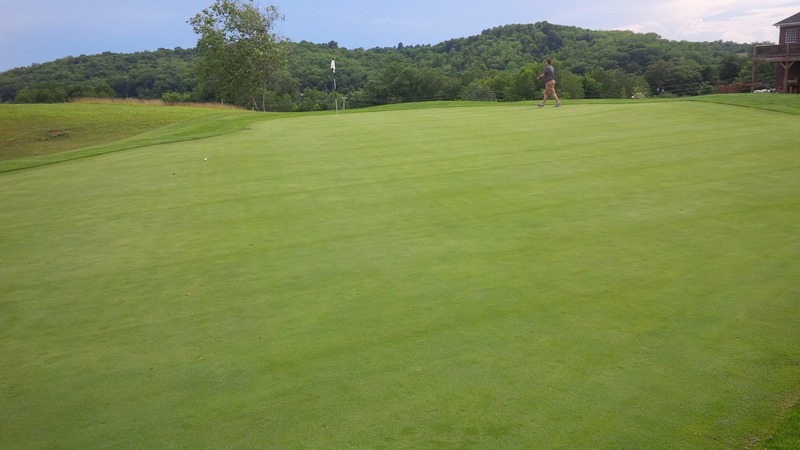 Amazingly, I’d hit the putt almost the perfect speed, so at least I’d gotten to the correct tier of the green. But there was literally nothing else redeeming in that botched putt attempt. I think I would have felt better about myself if I’d missed the ball all together on my putt attempt. After my recent experience, this is the new outer limit for me not having someone tend the pin for me. So, I ended up three-putting for a double bogey on a day that the greens were perhaps more predictable (just aim at the hole and hit it hard) than I’d ever experienced. The first lesson here is that leaves blown onto a green can, in fact, look an awful lot like golf holes. Be very sure you know the difference before you putt. The larger, more important lesson is that if there is even the slightest question of whether you can clearly see the hole or not, allow your friend or playing partner to do you the courtesy of tending the pin in the hole while you putt. Golf is a hard game. There is no shame at all in taking advantage of the rules when they may actually make your next shot easier. That is too funny and sad at the same time. I have to admit that I have lined up at the wrong spot before thinking it was a hole, but never actually putted. This is an awesome lesson, thanks.